Happy Tuesday! How are you all? Is it still winter where you're at? Last night, right after I finished my post where I told you it was raining, I let the dogs out our back door and discovered that it was POURING down snow! So beautiful. I'd stopped believing the weathermen because they've predicted snow for us multiple times this winter and we haven't seen anything significant yet. Look at what we woke up to! Sadly, most of it has now melted. I think they've predicted more for tomorrow though. 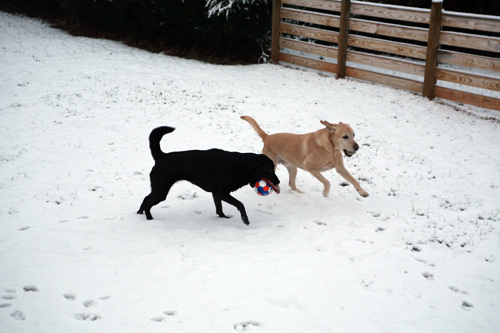 I don't mind the cold as much when we have snow to look forward to! Before I get to far ahead of myself, I wanted to share the last of yesterday's eats with you. I decided to discard the cabernet that I wasn't enjoying and made a snackie dessert bowl instead (are you proud, Sarah?!?). It was so tasty and SO much more satisfying than my wine! 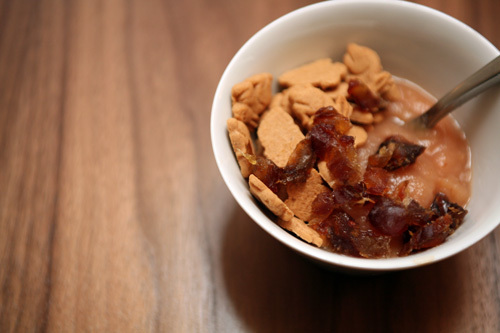 Last night's dessert: 1/2 cup unsweetened applesauce, Annie's Honey Bunnies, 1 chopped medjool date. My days are going by SO fast because I am SO busy at work! I've got a big deadline next Friday and I'm working really hard during the days to try and keep the late nights next week to a minimum. Its stressful, but I'd much rather be busy at work than bored like I was for the last few weeks. I had planned to get up early for some morning yoga, but forgot to turn my phone volume on after work yesterday so slept through my alarm for over an hour! Yikes. Needless to say I was in a bit of a rush, so I packed my breakfast to take with me to the office. 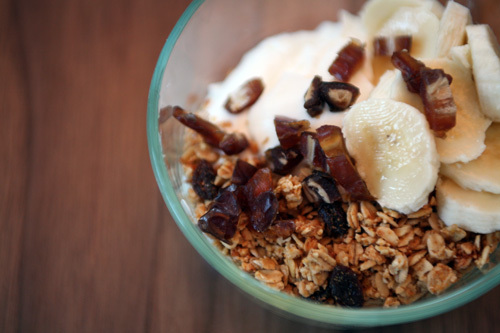 Breakfast: 6oz Fage 0%, 1/4 cup TJ's pumpkin spice granola, 1 banana, 1 medjool date. SO good! And it stayed with me for a full 4 hours. 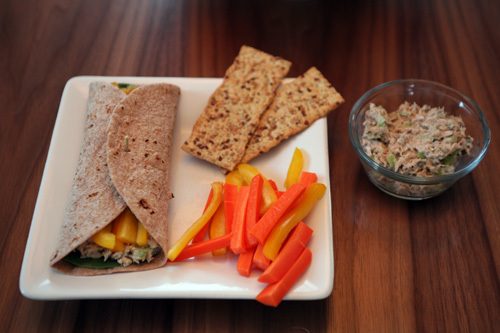 Lunch: tuna salad wrap on 8" whole wheat tortilla with yellow bell pepper and spinach, the rest of the tuna salad with peppers and carrots and two Back to Nature multigrain flax crackers. 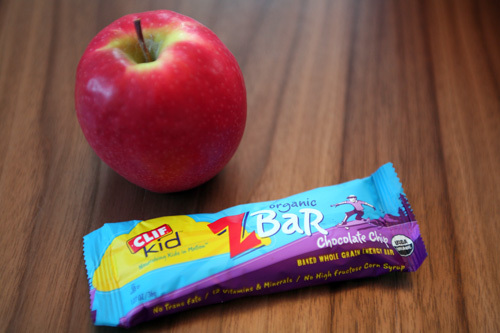 Snacks: a pink lady apple at 3:30 and a Clif ZBar at 5:30, to fuel me for a run. I decided to skip tonight's yoga class and go for a run. The weather was decent (30* and clear), and it got warm enough today to melt the ice on the sidewalks. They are predicting snow again tomorrow so I decided I should run while I had the chance, and go to a yoga class tomorrow night instead. It was great! I think my feet have gotten used to my new inserts because I didn't have much pain at all. I'm still planning to see a podiatrist because I don't think I should have to deal with any pain while running, right?!? Dinner tonight was inspired by Jen. I saw a smoked paprika salmon on her blog last week and remembered that we had some smoked paprika in our spice cabinet that was a stocking stuffer this Christmas (my family knows us well!). 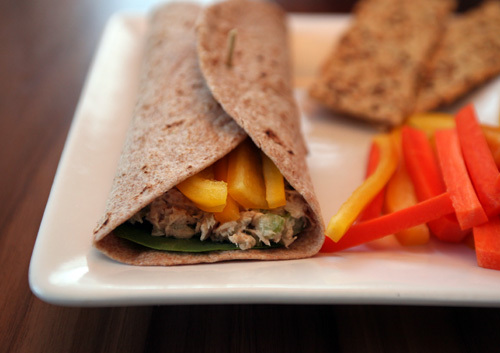 When I commented on her blog, Jen was sweet enough to send me this recipe to try out. 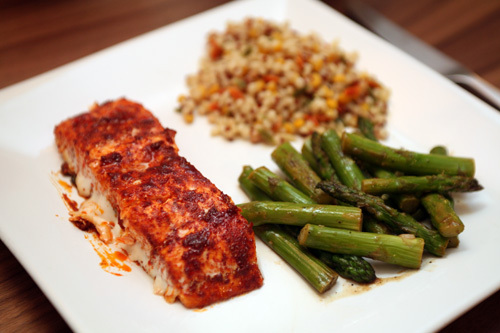 We didn't have time to marinade our salmon, but the rub was FANTASTIC. 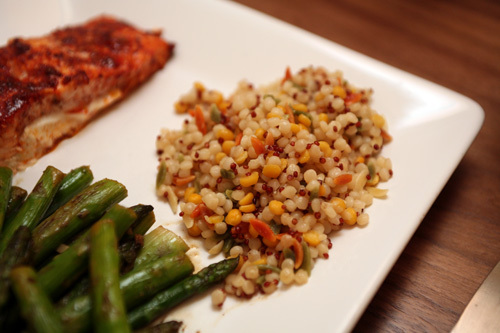 The asparagus was super-easy, and SO good! I heated olive oil in a non-coated skillet, then added 1 clove of garlic to saute' for about a minute. Then the asparagus went in, with some salt and ground pepper. After it had been cooking for 3-4 minutes, the garlic was really starting to brown and trying to stick to the pan. I splashed in about 1/2 cup of orange juice to de-glaze, gave everything a stir and covered the pan. 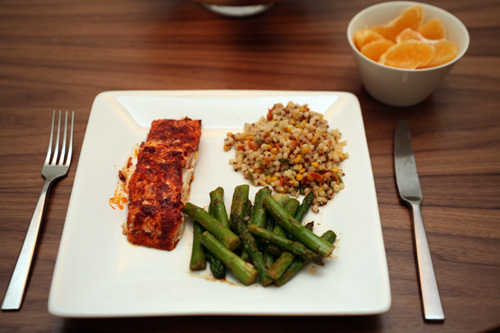 The heat was lowered to simmer and the asparagus cooked for another 3-4 minutes until tender. YUM. This TJ's blend was really good too...israeli couscous, baby garbonzo beans, orzo and red quinoa. We cooked ours in chicken broth for a little extra flavor.